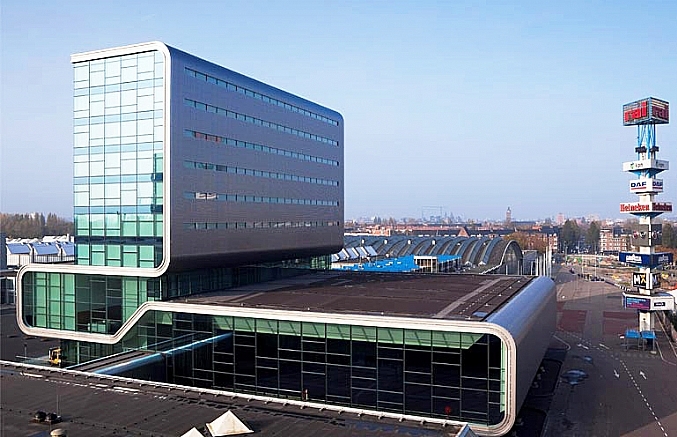 Elicium Expo/congress centre, Amsterdam RAI (Architect: Benthem Crouwel). When designing sustainable buildings the challenge lies in optimising the combination of artificial lighting and the incidence of daylight. The more daylight incidence the less artificial lighting is required and the less energy a building consumes. Increasing the surface area of glass is therefore an obvious solution. Glass surfaces can however cause energy losses and excessive solar radiation can cause excess heating load, therefore a balance must be found. 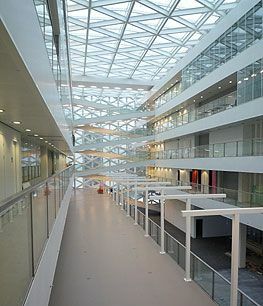 An effective method of increasing the incidence of daylight in buildings is the use of skylights. In Finland a relatively simple industrial building was investigated to determine the impact of skylights on the incidence of daylight and the heating load. Rooflights are preferred rather than vertical glazing high up in the facade, because they allow daylight to penetrate deep into the building. Overheating depending on the percentage of rooflights and the internal heating load. The value of 2 W/m2 represents a distribution centre. Lighting level requirements are low as is the internal heat load. Therefore solar radiation is the dominating factor. The 25 W/m2 value represents a shop. Higher lighting level requirements lead to a higher internal heat load. The value of 50 W/m2 represents a food factory. The internal production process produces so much heat that the building must be cooled by air conditioning or mechanical ventilation. For adequate incidence of daylight it is recommended that at least 10% of the roof surface is covered with rooflights, but not more than 15%, to prevent overheating. The incidence of daylight through skylights has the disadvantage that overheating of the space may occur during the summer. In addition, the low insulation of the translucent material in the cupolas will result in energy losses during winter. The Suntracker from Keromat in Emmen, the Netherlands does not suffer from these disadvantages. The Suntracker consists of a cupola containing a system of mirrors that point directly at the sun every 10 minutes during the day and provide an optimized lighting level in the workplace. There is a heat insulating layer under the cupola. The system is in use at the Tumakon engineering works in Hengevelde in the Netherlands as well as at other locations.